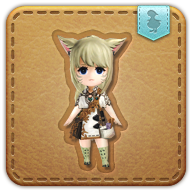 Summon your wind-up Zhloe minion. Cannot thank you enough, but will certainly try. Impressed with Zhloe's tireless efforts at the orphanage, a craftsman employed by Rowena's House of Splendors created an automaton version of the altruist and gifted it to her sister, Khloe...who silently added it to her table of rewards.